I have been wanting to share more art/paint techniques and tutorials with you guys and if you follow along with me on Instagram here, you may have noticed that I do a little bit of everything (acrylic, watercolor, gilding and mixed media). 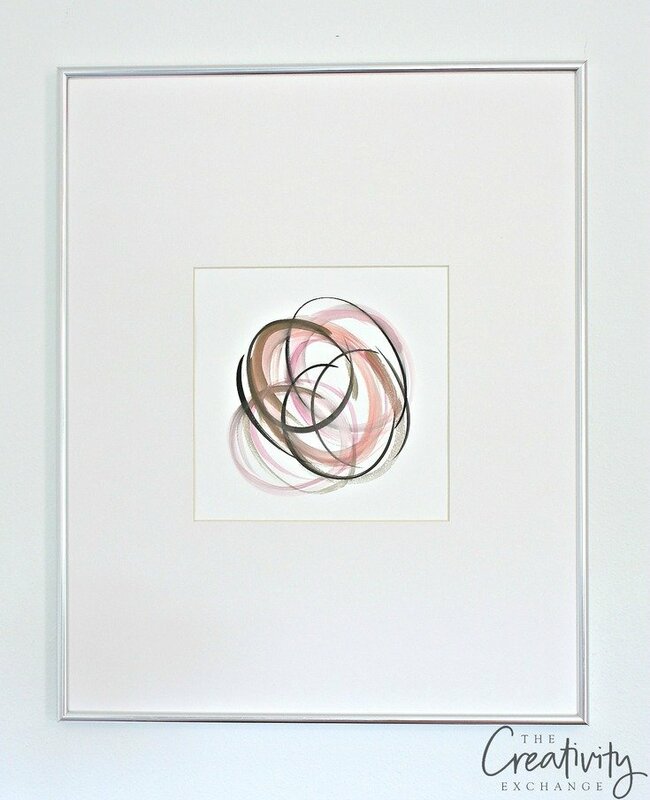 Today, I wanted to share a very easy DIY abstract watercolor art technique that is a great way to create your own frame-worthy art. If you’ve never painted before artistically, or with watercolors, don’t worry, I’m going to make it really easy for you and walk you through the simple steps. 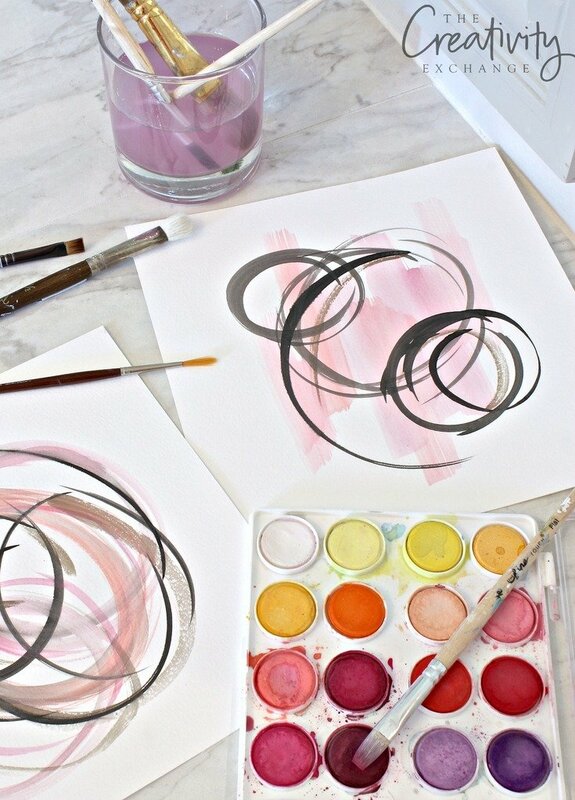 This abstract watercolor technique is an easy way to incorporate your colors into beautiful art. 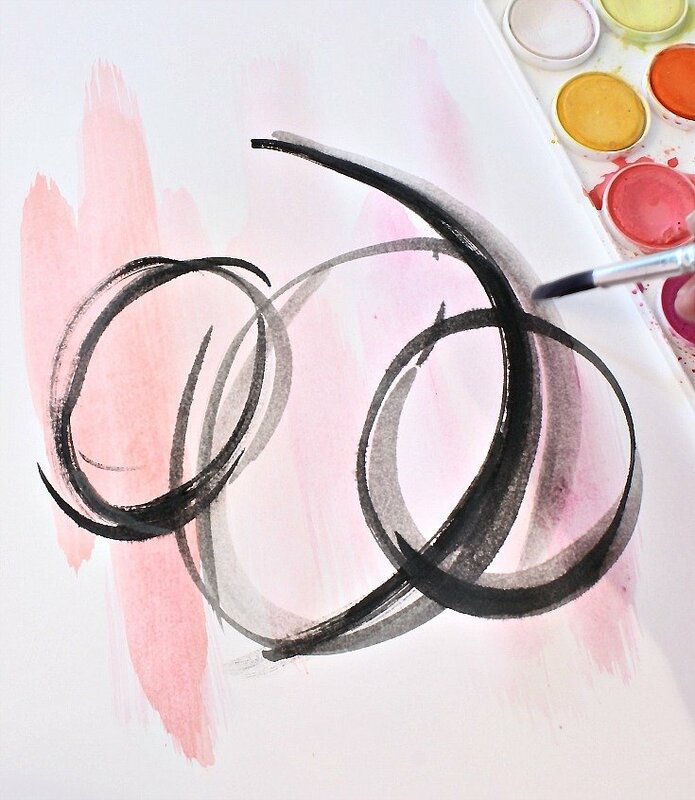 When it comes to painting artistically, the best way to get started is just to play. Even if you think you’re not creative, trust me, you can do this and you will surprise yourself. 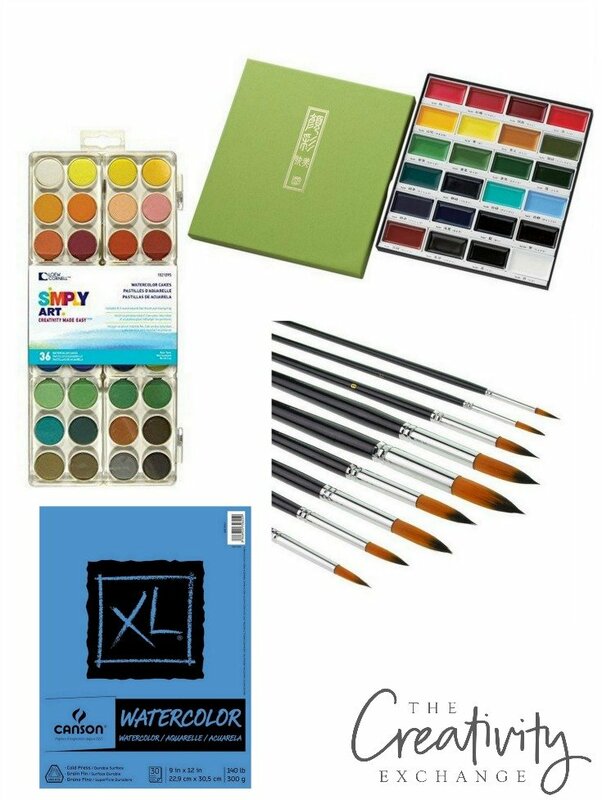 If you have the right tools and good paint/watercolors, you’re halfway there. I have used my set for years. I love this set because the colors are more subtile. 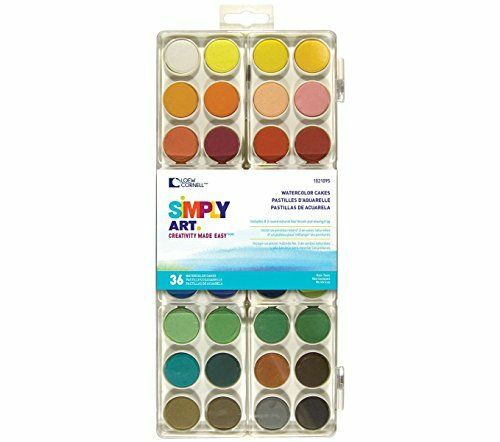 I prefer for my watercolors to be more soft but still great pigmentation and this set is perfect for that. 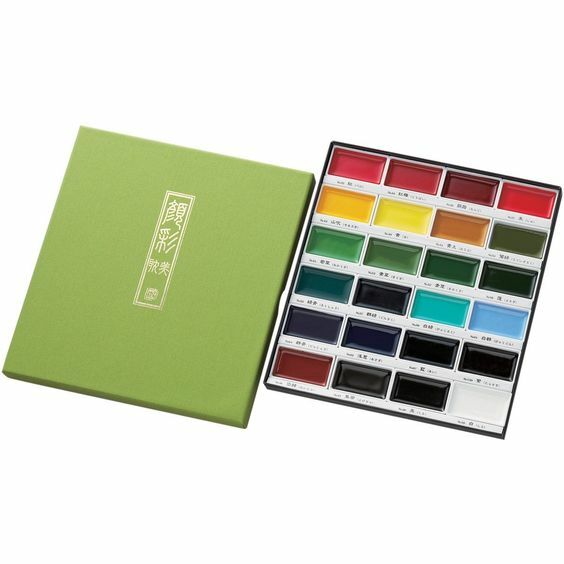 I also use these amazing Japanese watercolors from Kuretake that are very strong pigmentation and incredible colors. The set that I use is $23.88 from Amazon here (affiliate link). If you really want to get into watercolor painting, I recommend getting both sets because the Kuretake set is limited on colors like pinks and lime greens. 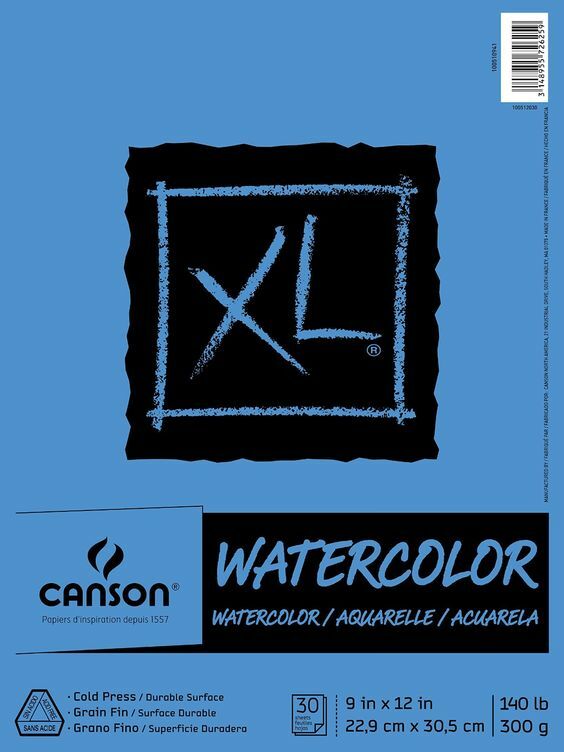 I use both sets together most of the time and the Kuretake is absolutely incredible but again, I need my Loews because I’m limited on colors. 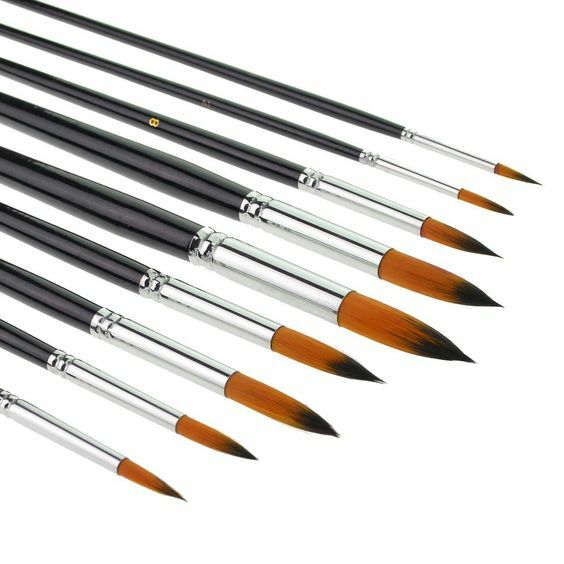 For brushes, any brush will work that says it can be used for watercolors. For this project today, you will need a large round type brush (#16) and a #6 small round. If you don’t have a good set of brushes, this set made by Marrywindix here on Amazon is an inexpensive set at $8.99 and a great one with 9 brushes and it has what you’ll need for this project. For paper, I recommend just playing and getting your technique down on cheap craft paper and even children’s white construction paper. While the cheap paper will curl because it’s not meant for watercolors but watercolor paper is more expensive and you’ll want to master your technique before you begin using the watercolor paper. For watercolor paper, not all papers are created equal! 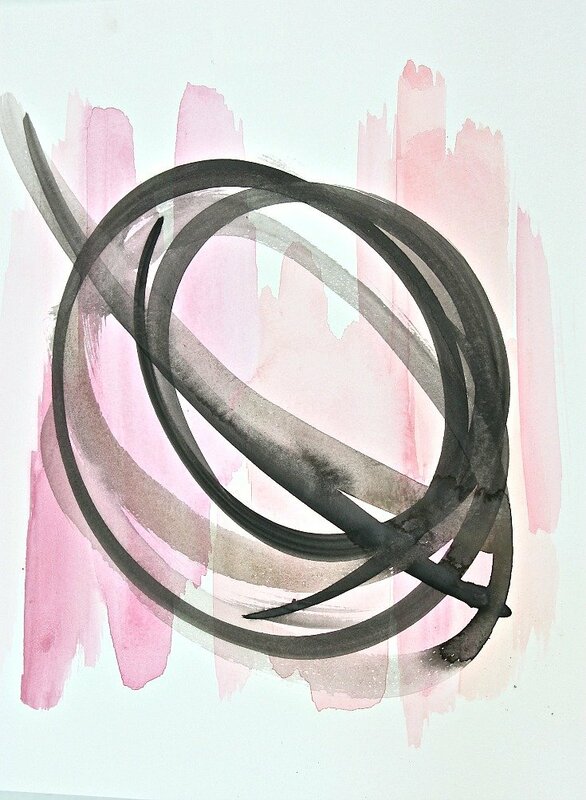 The best watercolor papers to use for framing and creating art should be around 140lb/300 grams or else it will curl. My favorite is this pad of 30 from Canson here because it’s such a good price at $7.99 on Amazon. I cut the paper in half for projects I’m going to frame. While I’m going to walk you through the steps that I did to make these particular designs but again, I really want to encourage you to play and explore with your watercolors. You will see that you can veer off and create your own designs and layout once you get comfortable and you can pick your best stuff for framing. To get started, you’ll want to think about your color palette. For these paintings, I like to use about 4-5 colors. 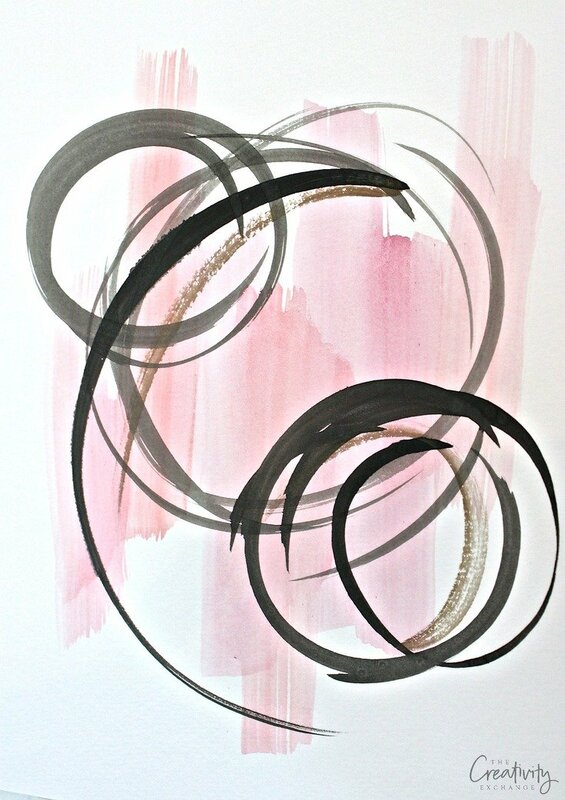 You will need a dark color like black, gray or navy to contrast and use for your circles. 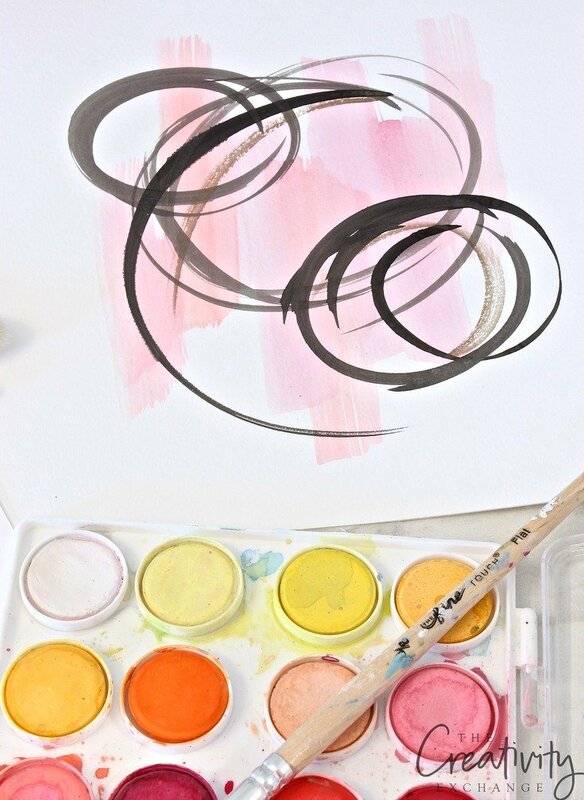 To do background swipes, use your large #16 round brush and get your brush wet in water and circle around in the color that you want to use. 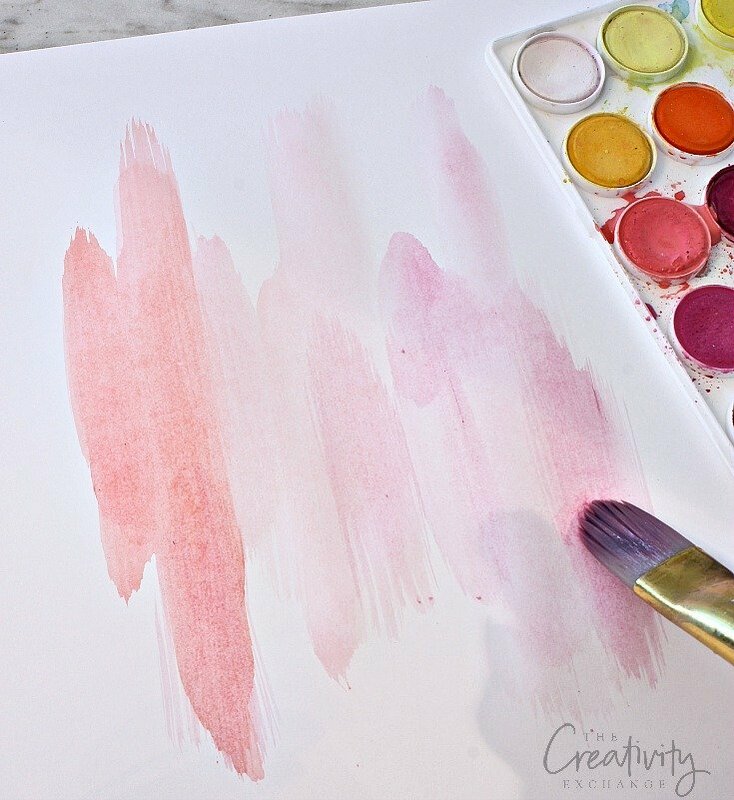 There are two things you need to know about using watercolors for this project (and all watercolor painting). 1) The less water you use, the stronger the color pigmentation will be. So for the background, you’ll want it soft/faint and less pigmentation. So you’ll use a lot of water to dampen your color. The second important thing to know when using watercolors is the more you push down on your brush, the thicker your lines/strokes will be. So for the background, you’ll want to swipe using the whole brush. To get that wispy-color trailing off look where your start and stop your paint, you get that look by using the brush like your sweeping the floors. Fast sweep. After you get your background on the paper (I’m just using practice paper for the sample), you’re ready to move on to the circles. You can let your background dry for about 5 minutes before starting circles. 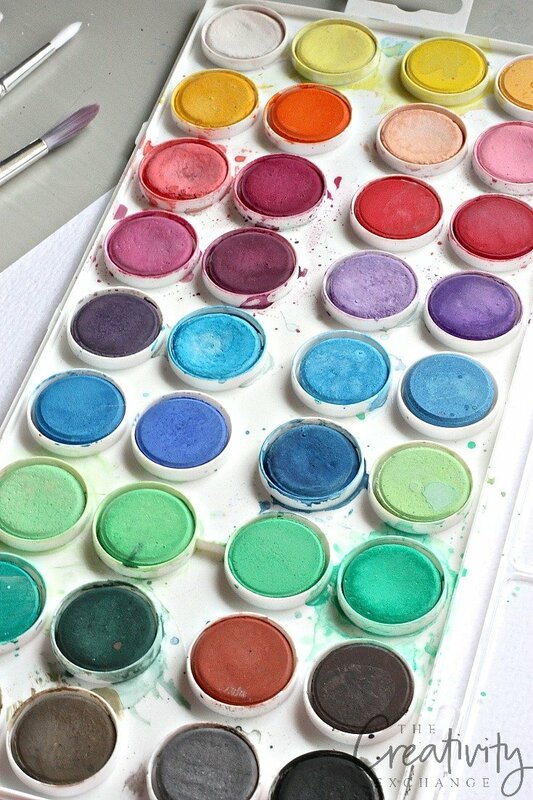 To do circles, again, the less water you use on wetting your color, the stronger the pigmentation. 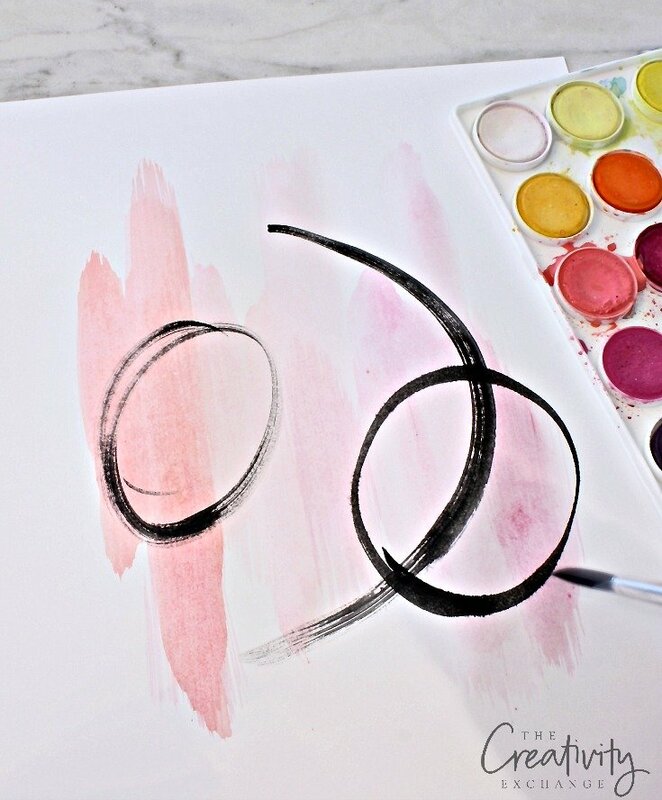 For the circles, you’ll want to use the small #6 round brush. Also, if you want very fine lines, just use the tip of your brush. 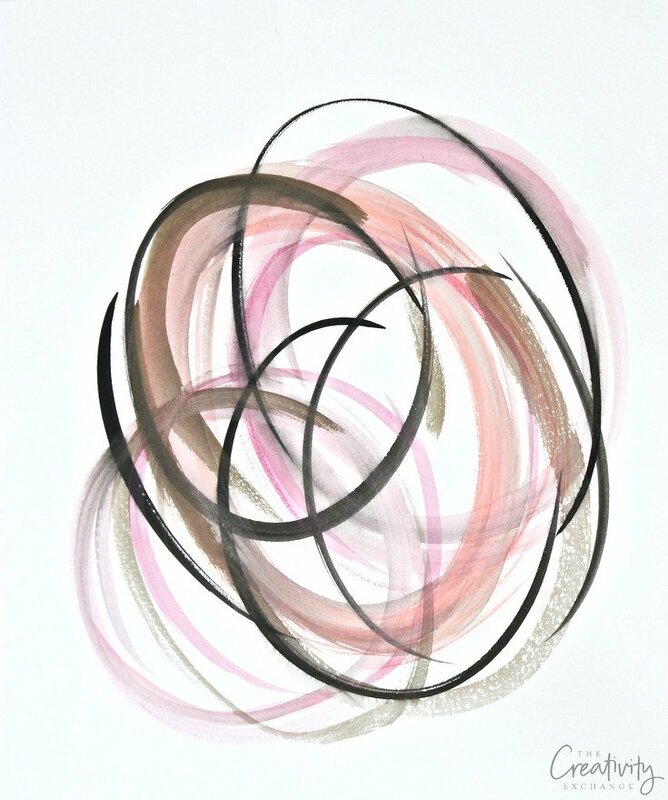 Think of your brush as a pencil when you make circles. If you think about making a quick half circle or complete circle with a pencil, you do it really fast. It works the same way with watercolors. For my sample above, I pushed down a little harder on my brush, so the lines are thicker. I also used very little water, which is why the color is so bold. You can do one large circle in the middle or smaller circles to begin with. Next, you can see above that I switched to gray and used more water to make the color softer and I used more of the tip of my brush for more narrow/precise lines. I did this in the center to fill in that negative space. Another thing I did was to go along side the black in areas just to add more depth. Here is my original finished piece again that I did on watercolor paper so you can see how to finish it off. I added a swipe of brown. 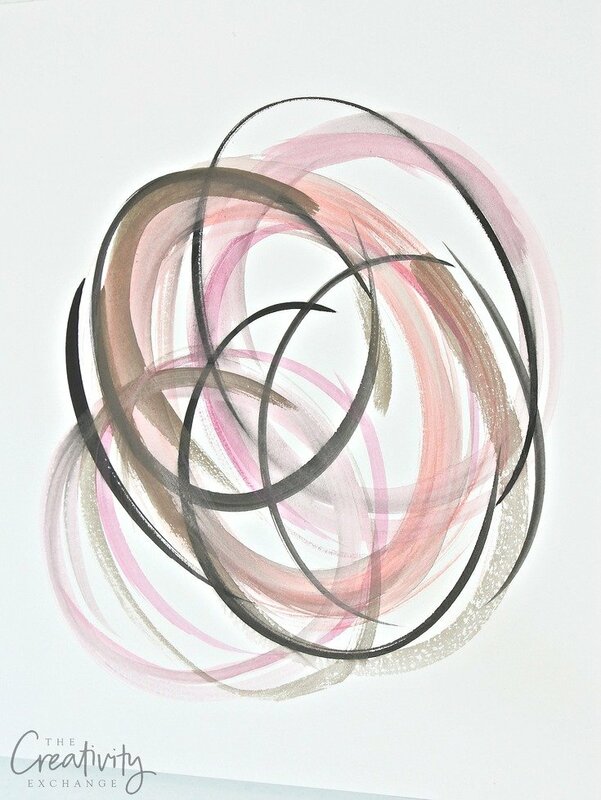 If you just want to do circles, you just use your brush like a pencil and go as fast as you can in a circular motion. I like to push down more on my brush on the first layers, so they are thicker and then switch colors and finish with more precise lines by using the tip of my brush. You can always go back again if you want to finish a circle or you can leave it as a half. When your finished, let the pieces dry overnight and then they’ll be ready for framing. I like to use oversized white mats with smaller squares in the middle for watercolors. I think the negative space with the art is such a stunning combination. So what do you think? Are you going to try this! I sure hope so! Painting with watercolors is so fun and relaxing. 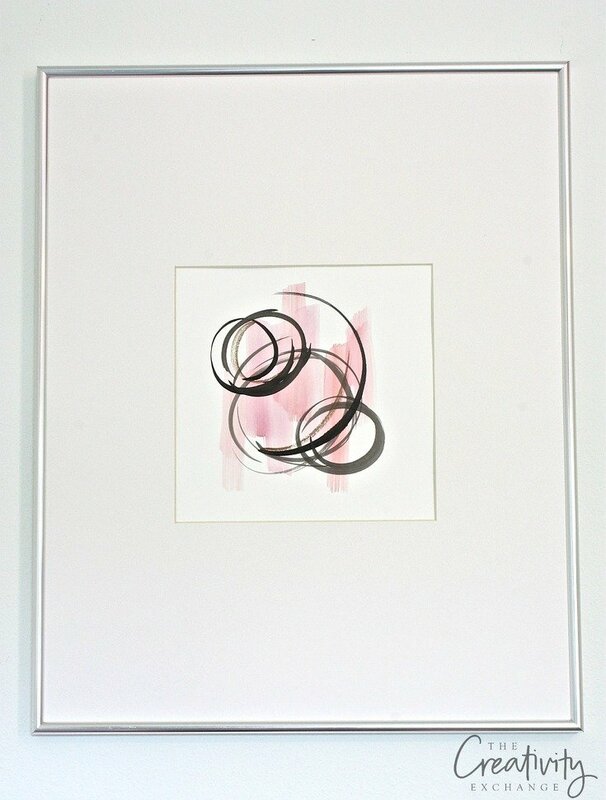 Even better, you can really create some great art for your home. **I use Amazon affiliate links for products in my post in which I receive a small commission. Cyndy, I love your art and thank you for posting about your technique and the supplies you use. These pieces are so pretty!! How beautiful! I just might try this one myself! Where do you get the oversize mats from? Thank you so much Barb! Yes, please try this! It’s so easy and just play with the watercolors too 🙂 I have my mats cut that size at the craft store. I really love oversized mats with smaller squares in the middle for art. It just adds so much on the wall and I love that negative space contrasting with the art. Hope that helps! I love this and thank you for being so detailed with your instructions! It really helps take away the scariness for me of starting an art project. Is there glass in the frame? And does the paper stay flat with the watercolor paint on it? Just came across this tutorial and I’m in love! Thanks so much for sharing step by step. Can you please share where you purchased the silver frames?